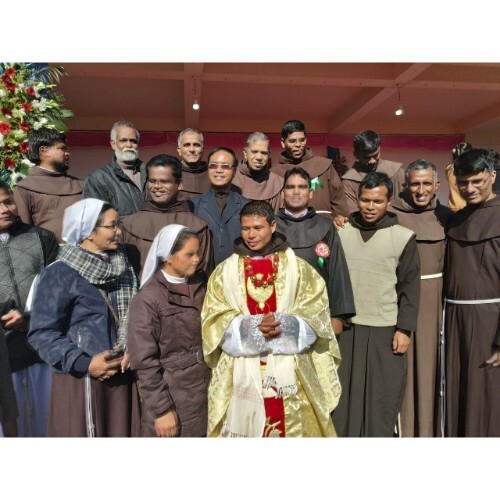 It was a moment of joy for the Foundation of St. Francis of Assisi, North East India, as Br Johnvinzen Lyngdoh Tongkhar OFM walked towards the Altar to be ordained to the Order of Priesthood. Br. John shall be the fourth friar priest from the Foundation. The Eucharistic celebration was grand and inspiring. The main celebrant was the Most Rev. Dr. Dominic Jala D.D. 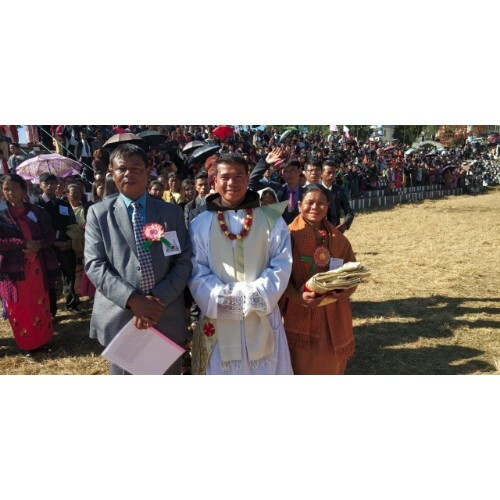 the Archbishop of the diocese of Shillong who is also the Apostolic administrator of the Diocese of Nongstoin. The solemn Eucharist was concelebrated by Br. Praveen Henry D Souza, the Minister Provincial, Br. Singarayar, the President of the Foundation, the Provincials of various congregations, priests of the Diocese, guest priests from various places. There was a good number of friars present for the celebration. The prayerful atmosphere began with the procession of the priests to the Altar of God together with the family members of the ordinandus. The ordinandus seated among the family members were called by the Vicar General of Nongstoin Diocese to present themselves to the Bishop. 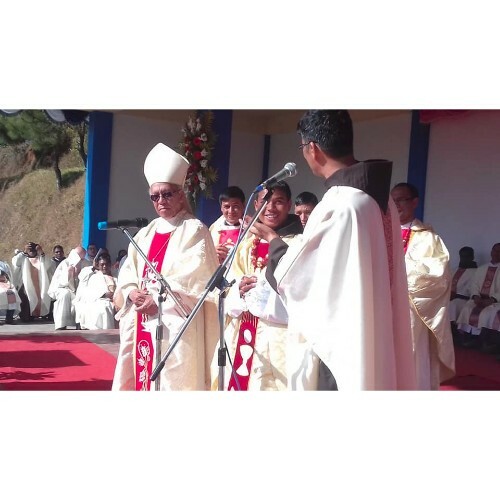 The Archbishop solemnized the celebration with the anointing of the four newly ordained priests. The new priests like Melchizedek of old joined the Archbishop to offer the Eucharist. The celebration was a joyous event as the melodious voices of the Cathedral Choir filled the air. The celebration was witnessed by an enormous amount of faithful. The new priests of Christ were joyfully greeted by the fellow priests, religious, family members and the whole congregation soon after the Eucharist. There was a fellowship meal, thereafter. After the Eucharist, there was Adoration conducted by the newly ordained priests. There was a warm felicitation programme for the newly ordained. The day ended with the solemn blessing given to us by Br Johnvinzen Lyngdoh Tongkhar OFM, Fr. Albert Lyngkhoi, Fr. Kenny Nongrum and Fr. Arnes Sohshang. The first Thanksgiving Mass of Br John was well attended by his village faithful and relatives. There were 15 priests together with Br. Praveen, the Minister Provincial and the local Parish Priest. The choir of the village sang beautifully and Br Stephen Lamin gave us a meaningful homily on the importance of a priest in the Church and the society. Towards the end of the Eucharist, Br. Praveen thanked Br. John’s mother and the family members for giving Br. John to the Order of Friars Minor. After the photo session, we had a procession from the church leading Br. John to his house with singing and dancing. The cutting of the Ordination Cake was a remarkable one in Br. John’s life and the family members and all of us. The celebration mood did not end there as the cultural program was arranged in his house and a special cultural dance was performed by the parishioners of Nongjri parish. The day continued and the program continued throughout the day. I was indeed happy to witness the celebration of the Ordination and the First Thanksgiving Eucharist of Br John vinzen Lyngdoh.